Messier 17 is an emission nebula in the constellation Sagittarius. 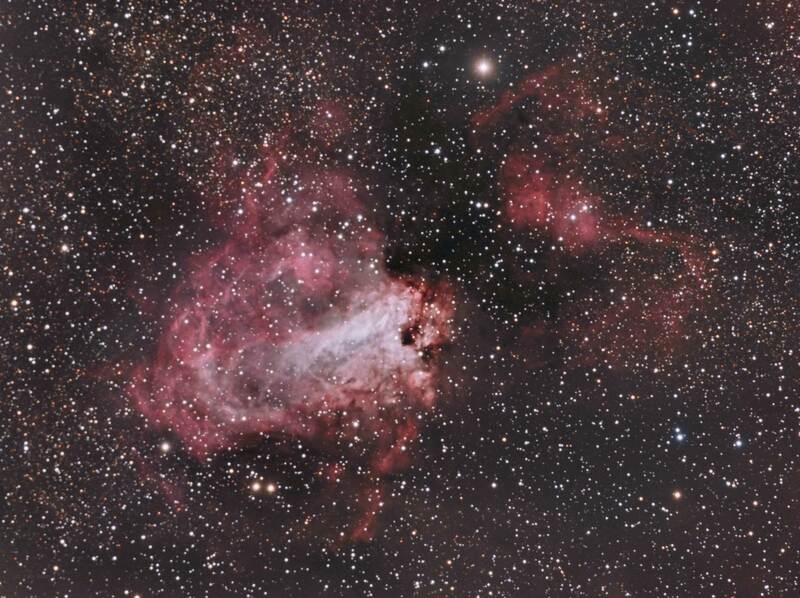 M17 is also known as the Omega, Swan, or Lobster nebula and lies in the Sagittarius arm of our galaxy. The illumination sources for the nebula are a group of stars behind the bright central gaseous region. These stars are not seen in visual images but are responsible for the unusual whitish color of this region. At first it would appear that any image of this area is over exposed but the whitish color comes from a mix of the reddish emission gas mixed with reflections of bright star light from the surrounding area. The entire nebula is an active star formation region. Surrounding the bright central region is a large emission cloud. This cloud has a very lumpy structure which indicates future star cluster development. Above and to the right of M17 is IC 4706 and IC 4707 and these are both listed as stars with nebulosity. This image was captured in one night from my house located in a Bortle 6 zone. I did try to capture this object two years ago with a 65mm refractor and a DSLR but was not really satisfied with the object or the results. I decided to try it again with a larger scope and CCD camera and I am happy I did. I was pleasantly surprised with the results considering the short exposure times. One thing that did surprise me was the lack of detailed information on M17. I searched several sites and most parroted each other. I then tried Google Scholar and found some more info but not as much as I expected for such a common target.